Last week, I had written an article about ten films that had an unfortunate 0% fresh rating on Rotten Tomatoes. A few days ago, I then received an email from a publicist that the new film, Hell or High Water, was enjoying a healthy 100% fresh rating. Though Hell or High Water “only” has a 98% fresh rating now, it can take solace in the fact that it joins films like E.T. The Extra-Terrestrial that also “only” have a 98% fresh rating. When I started looking at the list of films with a 100% fresh rating, I noticed that the list is populated with the classics that everyone knows: Wuthering Heights, Stagecoach, The Philadelphia Story, Citizen Kane, The Maltese Falcon, Suspicion, Meet Me in St. Louis, All About Eve, White Heat, Rashomon, The African Queen and Rear Window are just a few of the classics sitting at 100% after all these years. Another thing I noticed was that many recent classics and/or Oscar winners weren’t on the list. Part of this is probably due to the fact that there are a lot more “critics” out there reviewing movies thanks to the birth of the Internet. No offense to those classic films of yesteryear, but, as with my 0% fresh article, I stuck with more recent films. Here we go. The original documentary told the story of the three teenagers known as the West Memphis Three who were found guilty of the murders of three young boys. The filmmakers helped turn this case into a national phenomenon with many people protesting the West Memphis Three’s innocence. Many people were convinced they were convicted largely because the men wore black and liked heavy metal, including Metallica. In fact, Metallica allowed their music to be used in the original documentary – the first time the band allowed its music to be used in a film. The film soon garnered Hollywood’s attention. Celebrities like Johnny Depp, Peter Jackson, Margaret Cho, Eddie Vedder, Henry Rollins and Natalie Maines were publicly outspoken in their beliefs that the three men had been unjustly convicted. In 2011, the courts allowed the men to cop to an Alford plea, which let them be released with time served. Incidentally, Paradise Lost 3 ended up winning the Oscar for Best Documentary. 154 reviews were counted on Rotten Tomatoes and 154 critics rated this documentary as fresh. That’s by far the highest number of reviews for a film deemed as 100% fresh in the last 17 years. To put this in perspective, in the last eight years, the film with a 100% fresh rating with the second highest number of reviews is 2013’s The Tale of Princess Kaguya with 83 reviews. The film tells the story of Philippe Petit’s 1974 high-wire walk between the Twin Towers of New York’s World Trade Center. Like Paradise Lost 3, this film also won an Oscar for Best Documentary. Are you sensing a theme to this list yet? Taxi is yet another documentary. 91 critics deemed it fresh. When was the last time 91 people could agree on anything? Anyways, in 2007, America was waging its war on terror and the use of torture was a hotly debated topic on the 24-hour news cycle. The film focuses on the December 2002 killing of an Afghan taxi driver named Dilawar, who was beaten to death by American soldiers. Originally produced by the BBC, the documentary was picked up by HBO after the Discovery Channel, who had bought the original broadcast rights, refused to air the controversial film. And like the previous films on the list, Taxi went on to win the Best Documentary Oscar. If you don’t watch documentaries, maybe you should. There seem to be some good ones out there. Okay, this is another twofer. In my previous list, you got 11 films for the price of 1. This list is an even better deal as you’ll be getting 12 films for the price of 1. These also happen to be the first non-documentaries on the list. 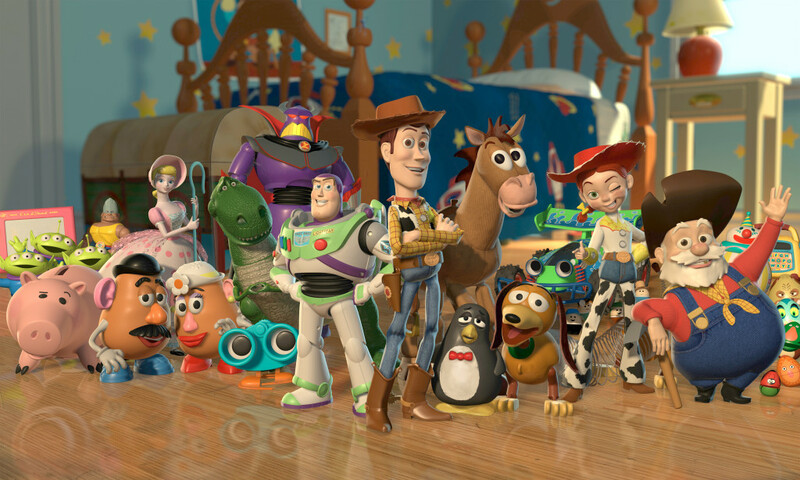 Toy Story was an unqualified smash and turned Pixar into arguably THE Hollywood animation powerhouse. Though poor Toy Story 3 “only” sits at a 99% fresh rating, it can console itself with the fact that it’s the only film of the three that can boast an Oscar nomination for Best Picture. 2018’s Toy Story 4 has some pretty big shoes to fill. Another 100% fresh rating, another film from 1995. Oddly, neither of the two “big name” films from that year with a perfect rating made the Oscar short list for Best Picture. FYI, the five films up for Best Picture that year were Braveheart, Apollo 13, Babe, Il Postino and Sense and Sensibility. You can discuss amongst yourselves whether or not Toy Story and Before Sunrise were more deserving of Oscar nods than some of those films. Anyways, director Richard Linklater was already a critical favorite due to his previous films, Slacker and, one of my personal favorites, Dazed and Confused. He did go on to win the Best Director Oscar for 2014’s Boyhood however. Prolific documentarian, Roger Moore, made his feature debut with this gritty take on the fallout that his hometown of Flint, Michigan suffered when General Motors closed several plants. Though it was obviously one of most critically loved films of the year and was the most successful documentary at the box office at the time, it didn’t receive an Oscar nomination for Best Documentary. Moore, however, would win the Oscar in 2003 for Bowling for Columbine. Though they had been making films for decades, this is the film that really put Merchant Ivory (director James Ivory and producer Ismail Merchant) on the map. The cast was led by two-time Oscar winner Maggie Smith and introduced most of the world to future Oscar winners Judi Dench and Daniel Day-Lewis and future Oscar nominee Helena Bonham Carter. A Room with a View kicked off a prolific period for Merchant Ivory. Their 1990 film, Mr. and Mrs. Bridge, starring Paul Newman and Joanne Woodward, resulted in an Oscar nomination for Woodward. 1992’s Howard’s End was a huge critical hit, resulting in nine Oscar nominations and three wins, including a Best Actress statue for Emma Thompson. 1995’s The Remains of the Day garnered eight Oscar nominations including acting nods for Anthony Hopkins and Emma Thompson. Though The Terminator is a classic, and is responsible for one of the best sci-fi movies of all time, Terminator 2: Judgment Day, I was surprised to see this on the list. Sci-fi movies, no matter how well made, always have their detractors. Anyways, The Terminator launched the careers of Arnold Schwarzenegger, director James Cameron and producer Gale Anne Hurd (The Walking Dead). In a weird twist of fate, the studio wanted O.J. Simpson cast as the terminator, but Cameron didn’t think audiences would buy him as a killer. Sylvester Stallone and Mel Gibson turned down the role before it was offered to Schwarzenegger. Though director Ridley Scott had already directed the huge hit, Alien, the studio wasn’t confident in his vision for Blade Runner and made extensive changes. The film was originally released to incredibly mixed reviews, but it soon became a cult classic. In 1992, Warner Bros. released a Director’s Cut which was more in line with Scott’s original vision. In fact, Blade Runner: The Director’s Cut was one of the first movies to be released on DVD. To celebrate the film’s 25th anniversary, Warner Bros. released Blade Runner: The Final Cut in 2007. The Final Cut impressed critics and fans alike and is now THE definitive version of the film. Atlantic City’s claim to fame is that it’s one of 41 movies to earn the “Big Five” Oscar nominations (Best Picture, Best Director, Best Actress, Best Actor and Best Screenplay). It also has the notoriety of being one of the 8 of the 41 films that walked away from the Oscars empty handed. For the record, the other seven films are Cat on a Hot Tin Roof, The Hustler, Bonnie and Clyde, Love Story, Lenny, The Remains of the Day and American Hustle. After being best known until then for her role in The Rocky Horror Picture Show, Susan Sarandon’s Best Actress nomination showed the world her acting chops. Though she lost to The Coal Miner’s Daughter’s Sissy Spacek that year (oddly enough, The Coal Miner’s Daughter also has a 100% fresh rating), Sarandon would earn four more Oscar nominations and get the win for Dead Man Walking.